The beautiful water of the Atlantic Ocean and the deep blue of the Gulf Stream located off Atlantic Beach, Morehead City, Beaufort, and Emerald Isle North Carolina are considered by many, A Fisherman's Paradise. Whether its Deep Sea Bottom Fishing on the Capt. Stacy IV headboat for Red Snapper, Grouper, Trigger Fish, Black Sea Bass and Amberjack or Sports Fishing on a charter boat for Blue Marlin, Tuna, Mahi Mahi, King Mackerel or Spanish Mackerel, The Capt. Stacy Fishing Center which is centrally located on the Atlantic Beach Causeway has the boat for you. Capt. Sonny Davis (the main man) can help you with anything that has to do about fishing He started the business back in 1960 which he learned from his father. Loretta & Joyce (daughter & wife of Capt. Sonny) along with Faith , Terry , & Kathy will be more than willing & able to help you with any fishing and reservation questions that you may have. They will try to book you on the boat that will be best suited to your needs. Capt. Maurice Davis Jr. is a 3rd generation captain. Maurice has the experience of running the Capt. Stacy IV since 1982. Before that he worked with his farther Capt. Sonny Davis who has over 50 years as a captain. We pride ourselves in having a helpful, friendly, and experienced crew. Joseph Davis is the 1st mate and is the brother of Capt. Maurice he has been doing his job for the last 20 years. Joe along with the other mates will try to give you a helpful enjoyable time. Aboard Capt. Stacy IV Capt. Stacy IV is a 83ft headboat equipped with some of the most modern electronics available, and was recently repowered in the Spring of 2008. The Capt. Stacy IV is licensed for 100 passengers But! keeps passenger loads to 80 passengers or less on an offshore trip. There is a wide selection of charter boats available. Whether you are looking for something simple or luxurious we can find the boat for your group. Our boats range in size from 32ft to 65ft. All boats in our facility are kept in top-notch shape keeping up with current USCG regulations for safety of passengers. 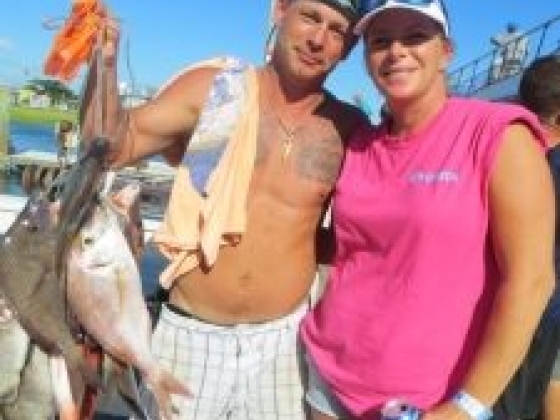 Trips and Rates Full Day Bottom Fishing Fishing 30 to 50 miles offshore in the beautiful Atlantic Ocean for Red Snapper, Silver Snapper, Grouper, Trigger Fish, Sea Bass, Amberjack and Spot Tail Porgies SAILING SCHEDULE: Departs 6:00 am - 5:00pm. March 1st thru Nov. 30th (Mon, Weds, Fri, & Sat) Jan. & Feb (Weekends only) Adult - $100.00. Child (12 & under) - $65.00. Rider - $50.00 Schedule & pricing subject to change: call to confirm prices and schedules Half Day Bottom Fishing Half Day trips are a great alternative for the whole family if you do not have the time for a full day trip. Fishing 15 to 18 miles out in the Atlantic Ocean you are able to catch Black Sea Bass, Spot Tail Porgies and the occasional Grouper and Vermillion Red Snapper. This trip will give you time for fishing in the morning and you will get back to the dock early enough to enjoy other activities. SAILING SCHEDULE: Departs 7:00 am - Returns 1:00 pm March 24th - thru- Sept. 29th - Tues, Thurs, & Sunday Adult - $65.00 Child - $50.00 Rider - $50.00 Shark Fishing For something different the Capt. Stacy IV offers night time Shark Fishing Trips. Sand Sharks, Tiger & Black Tip are among the few species just waiting to take a bite out of something. Getting hooked up with one of these can prove to be very exciting. 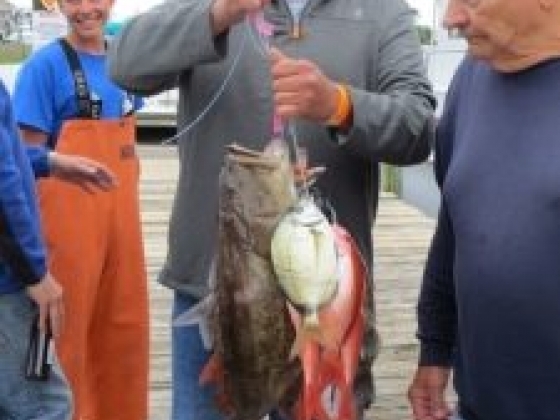 DEPARTURE SCHEDULE: Departs 6:00 pm - returns 10 pm Tues & Thurs Departs 7:00 pm - Returns 11pm every other Sat Starts Memorial Day weekend thru Labor Day weekend Adult - $55.00 Child - $45.00 24 Hour Overnight Bottom Fishing This Trip has become quite popular for the serious fisherman. With extended hours of fishing time and a two day bag limit this trip is known for bringing in an abundance of fish. DEPART SCHEDULE: Depart at 7:00 pm Saturday and return 7:00 pm Sunday every other weekend. fish guy kid love to fish yellow fin pink Adult - $185.00 p/p 2018 - 24 Hour Overnight Trips Available Dates March 04-05, 25-26 April 08-09, 22-23 May 06-07 , 20-21 June 03-04, 17-18 July 01-02, 15-16, 29-30 Aug: 12-13, 26-27 Sept 09-10 , 23-24 Oct 07-08, 21-22 Nov 04-05, 18-19 Private Sports Fishing Charters Capt. Stacy Fishing Center has been the one stop place to meet all our fishing needs for over 15 years. No need to call all over the place to put together a trip. 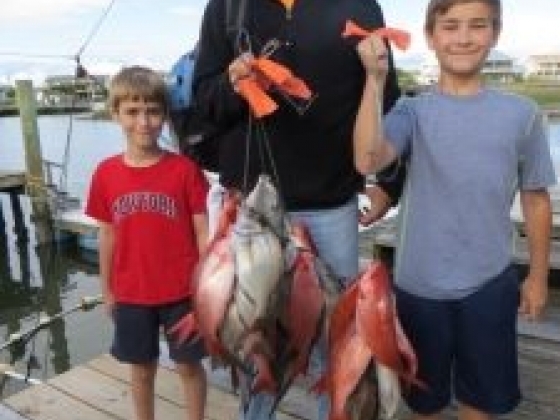 Whether it's bottom fishing for those delicious Red Snapper, Grouper, Trigger Fish, or It's the Big One you're after it can be handled at the Capt. Stacy Fishing Center. We can arrange a fun packed day for Tuna, Mahi Mahi, King Mackerel, Spanish Mackerel, Wahoo on a Private Sports Fishing Charter carrying 6 passengers. There is a variety of boats to choose from. Just let us know your needs whether it's a company trip or a family outing we'll help you arrange a boat that best meets your needs. Box lunches can also be arranged. Fish Cleaning is also ava upon your return to the dock. Winter Blue Fin Trips are a blast also. All Charters carry 6 Passengers or less. 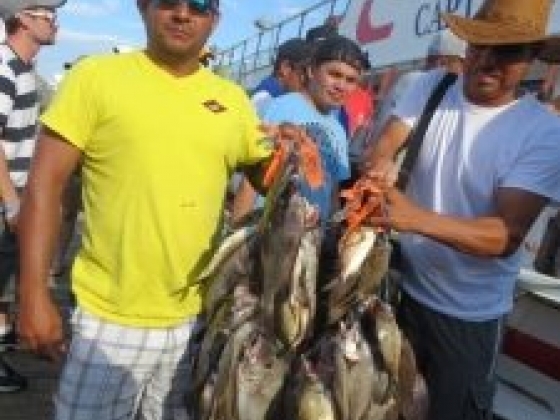 (Prices on sports fishing charters vary according to amenities and size of the boat.) HALF DAY: (apprx 5 hrs) $450.00 to $600.00 3/4 DAY: (apprx 8 hrs) $800.00 to $1,000.00 FULL DAY: (apprx 11 hrs) $1,450.00 to $1,750.00 Frequently Asked Questions WHAT KIND OF EQUIPMENT DO YOU USE? Reels: 4/0 to 6/0 reels Hooks: 2/0 to 5/0 Line: 40 to 80 lb test line WHAT KIND OF BAIT DO YOU USE? We use boston mackerel & squid. You may purchase specialty bait in our tackle shop. CAN I GET MY FISH CLEANED WHEN I GET BACK TO THE DOCK? Yes! We have a fish cleaning service here at the dock. DO I NEED TO MAKE RESERVATIONS? Yes. This is best done by calling the number listed below. We also require a deposit of $ 25.00 p/p to hold reservations. This can be done after you make your reservation. By mailing in a check or money order or you may use any major credit card to hold reservation. WHAT AM I ALLOWED TO BRING? Prices Include: Rods & Reels, Bait, Tackle and we keep your fish Iced down and seperated while you are on the boat. We have a complete galley where you can purchase hot and cold food & beverages. CAN WE BRING OUR OWN COOLER? Absoutly NO Empty coolers (coolers are considered empty unless they contain food and/or sodas) and must be smaller than 48 quart - Limit one cooler per person on the 24 hr trip. on all other trips one cooler per group of 4 or less. NO EXCEPTIONS!! !